My significant other was married for 52 years. We met online. Their anniversary and her death date anniversary approach. “I cried yesterday.” We are preparing dinner in my kitchen. “It’s been less than two years,” I say. I might have said more: that it’s OK to talk about her, that love never dies, that tears are helpful, that I wish I had known her, that love is not scarce, that I’m not jealous. But never mind, there will be more times we speak of her stronghold in his heart, of their love and of ours. Dressing in his house Sunday, I am without earrings for church. “I offer you these,” he says, displaying a box of jewelry. I select a pair and poke them into my pierced ears. I request and use her work gloves to plant a sweet potato vine to climb the mailbox. Her ashes, a purse, jewelry, vitamins, and house slippers remain in the closet where my skirts, dresses, pants now hang. She and I co-exist in the closet and in his heart. When first I enter that closet with the scarlet velvet box, I am freaked. Wouldn’t it be “healthy” if that could be removed to make room for me in his life? But I keep this thought silent. Their love will remain and it’s ok. Love is unlimited, and remains after death. Maybe the scarcity of love is not a reality but a poverty of imagination. The give-and-take long dance between them has sculpted him into a flexible, giving, beautiful person. I no longer search for love but enjoy its rich abundance. Nancy is creating a new life in Decatur, Georgia, with her new husband, Bill. They said their vows in February, 2018. 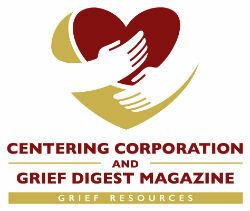 The Velvet Box is her fourth story for Grief Digest.